Both male and female can experience bald patterns, usually much later in their lives because of aging and genetics. SpaMedica’s hair loss clinic is looking to offer you the cure to baldness with our variety of hair loss treatments. Patients have seen exceptional results after a year. There are a variety of hair loss treatments available, including grafting, FUE and PRP for hair. Patients who are not interested in strip grafting would be pleased to know that is not the only hair loss treatment available for patterned baldness. The Artas Robtic FUE is a robotic machine that randomly selects hair follicles that will be harvested and implanted onto the bald spots of the head where thinning has started to happen. Other hair loss treatments include PRP for hair loss, which is even less invasive, and requires only the patients blood to be injected onto the scalp. The PRP is a component of the blood (after it is centrifuged) that contains growth and stem cells for hair rejuvenation. The hair specialists at SpaMedica will figure out the best hair loss treatment for you after careful examination and extremity of the hair thinning and pattern baldness. Patients showing signs of hair loss and baldness are suffering from a very common condition, specifically the lack in numbers, density and volume of hair shafts resulting in thinning of the hair or even baldness. The most common causes of thinning and balding hair are hereditary in that there’s a predisposition passed on from one generation to the next for thin, receding hair, generalized hair thinning, as well as baldness. Males are more commonly affected than females, as there are specific testosterone related factors in the local environment of the scalp that contribute to this occurring. The attractive qualities of males are numerous, but one of the more main ones is usually a thick, full head of hair which indicates youth, virility and vitality. Partial loss of hair and thinning of hair can be very distressing and aesthetically displeasing for men and women alike. SpaMedica offers patients many treatments for hair loss and baldness, including hair transplant, hair restoration and replacement. There are a variety of topical medications that can be used to stimulate hair growth and hair enhancement in those with mild to moderate thinning of the hair, and this can be quite a successful medical treatment. The most common non surgical, topical hair loss treatment applied today is Propecia. Patients with thinning hair and early signs of baldness can be evaluated by one of the SpaMedica’s cosmetic dermatologists and cosmetic plastic surgeons to see if they are a candidate for the Propecia treatment or other topical hair growth enhancers. Hair transplant procedures have evolved over the past ten years, going from unattractive, obvious clumps of hair bolted into the scalp, into effective treatments yielding natural looking and very aesthetically pleasing results. This state-of-the-art in hair transplantation occurs with the transfer of mono follicular units. Mono follicular unit hair transplantation means the transfer of one hair at a time. When done well, follicular unit transfers or single hair graft transfers can result in a very natural, “non-operated upon” look and an increase in the thickness, fullness and lusciousness of the hair pattern. 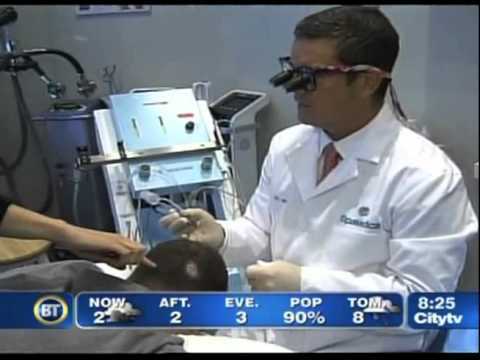 The mono follicular hair transplant technique can be automated with the use of a device called the NeoGraft® Hair Transplant. The NeoGraft device automates the harvest of the single, small follicles from the back of the scalp (Monofollicular Units or MFU’s), delicately extracted one at a time, avoiding the aesthetically displeasing and often painful, long “back of the head” scars associated with strip grafting harvesting (in the past a scalpel was used to remove a wide strip of hair at the back of the head, leading to a scar that is frequently noticeable). The automation of the NeoGraft harvest and implantation technique not only makes the MFU transfers consistent and fast, but these very features make the process affordable. The use of mono follicular grafts, or single hair grafts, in the NeoGraft technique allows single hair graft insertion at the frontal hairline and top of the scalp avoiding the stigma of old fashioned hair grafting using two, three or more hair plug clumps. In general, once patients undergo the mono follicular graft hair transplantation they will not experience ongoing hair loss at the top vertex or front of the scalp. The reason for this is that the follicles transferred from the back of the head have genetic and metabolic characteristics that make them resilient to the hormonal and metabolic environment of the follicles that existed naturally at the top and front of the scalp, which were susceptible to hair loss. The back of the hair, as a donor site, ensures that resilient hair is brought into the front of the hairline, sides and top of the scalp where they may thrive, survive and grow in an otherwise hostile terrain that led to the initial baldness. Other topical treatments and strategies can be used to maintain, enhance and preserve your hair restoration treatment. If you are interested in seeking a consultation with Dr. Mulholland and his SpaMedica hair loss clinic, simply fill out our online consultation request form or call SpaMedica now at 877-695-2835 to schedule a consultation. Patients that are seeking hair loss treatments for bald patterns should simply fill out the appointment request form or “ask a question” form and upload up to 3 photos for Dr. Mulholland to review. Dr. Stephen Mulholland and his medical team have been treating hair loss and baldness in his Toronto SpaMedica clinic since 1997. SpaMedica is one of Canada’s most reputable and experienced hair restoration centres, combining the most advanced, cutting edge technology with the superior skills and expertise of our hair loss treatment team. Our hair specialists are experienced in treatments for hair loss and helpful to people who are seeking cures to baldness. Don’t worry about bald spots anymore! Speak to our specialists to learn more about your options for hair growth and restoration.